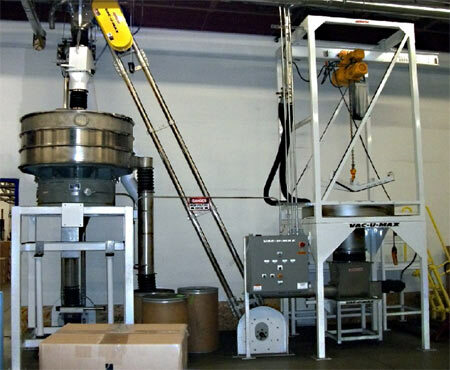 The VAC-U-MAX Aero Mechanical Conveyor is designed to convey bulk powders from the source to the process. Ideal for food and industrial applications. The Aero-Mechanical is a cost effective method for conveying materials. 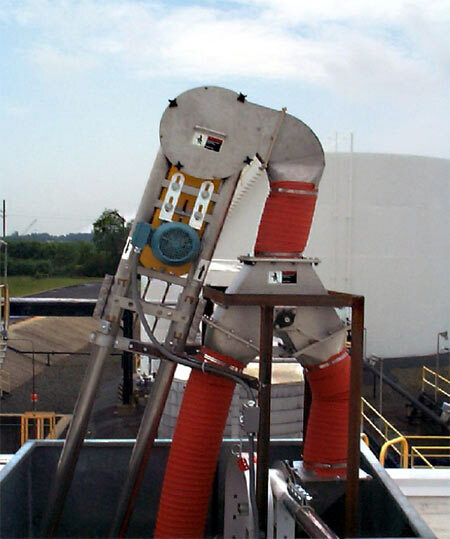 An Aerocon Aero-Conveyor is constructed of two parallel tubular housings (typically 3" or 4" tubes) containing a continuous loop of steel cable. Polymer discs smaller than inside diameter of the tubes are mounted at equal intervals along the steel cable. One side of the housing is for conveying, and the other is for return. Material inlets and outlets are suitably located for the application. Two sprocket assemblies, one providing drive and linked to a small motor (typically 2 or 3 hp.) and the other guiding the return, complete a basic system. The versatility of aero-conveying permits additional tubing, sprockets, inlets and outlets, angles, bends, horizontal and vertical configurations, to form a continuous system ranging from 10 feet to about 120 feet. Several systems can cascade to cover greater distances. Material entering the inlet is moved in a fluidized form, by pockets of air between the discs, further aided mechanically by movement of the discs. Controlling the velocity of the cable assembly determines the nature of conveying and movement of the product. Aerocon has conducted research and tests which enable the user to move certain products at critical speeds, approaching the equivalents of dense or dilute phases in the system. 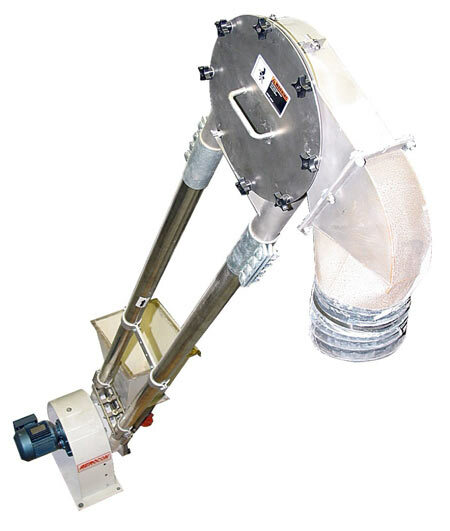 High speed, lean (or dilute) phase conveying fluidizes the material and handles particles more gently than pneumatic conveying. The dynamics of fluidization within the cable-disc configuration, around the corners, causes minimal impact between particles and against the housing. The result is less particle degradation, less conveyor wear, than with dilute pneumatic conveying. Low speed, dense phase aero-conveying further reduces particle degradation and conveyor wear by controlling the material's optimum conveying velocity. The use of long-radius bends further reduces particle impact. (Aerocon detailed test results on a wide variety of materials are available on request.) Results permit dense phase aero-conveying of friable materials such as cereals and energy requirements, or capital outlay. Considering the small motor (generally 2-3hp) which is the only power source needed for either high, low, or variable speed operation, operating costs are modest. In comparison to other forms of conveying, which may require a dedicated supply of high pressure air, filters to retain dust within the system, and suffer from the occurrence of associated maintenance, the cost differential is substantial. From a continuous operating standpoint, the overall maintenance of an Aerocon system is limited to occasional tightening of the steel cable, and the occasional replacement of a disc and cable assembly. Product retention in the conveyor system is very low with the Aerocon unique housing designs. In many applications a simple cleaning procedure is accomplished in minutes. Of the many operating systems currently being used, the track record speaks for itself. In keeping with all responsible manufacturers, Aerocon strives to make their products completely safe in operation. For this reason, guards and safety interlocks are provided on potential hazardous areas such as belts, quick access features. Aero-Conveyors are designed to be integrated into the customer's plant and all safety devices should be in place and operational before running the equipment. 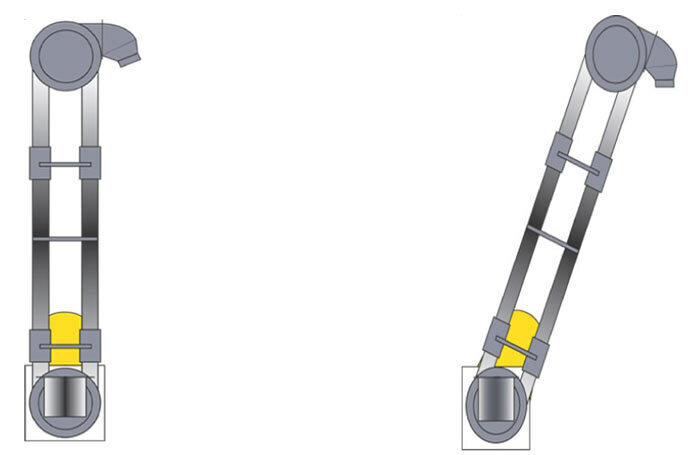 Details are contained in, but not limited to, the operating manuals and drawings provided with the machines. Extra copies are available on request. 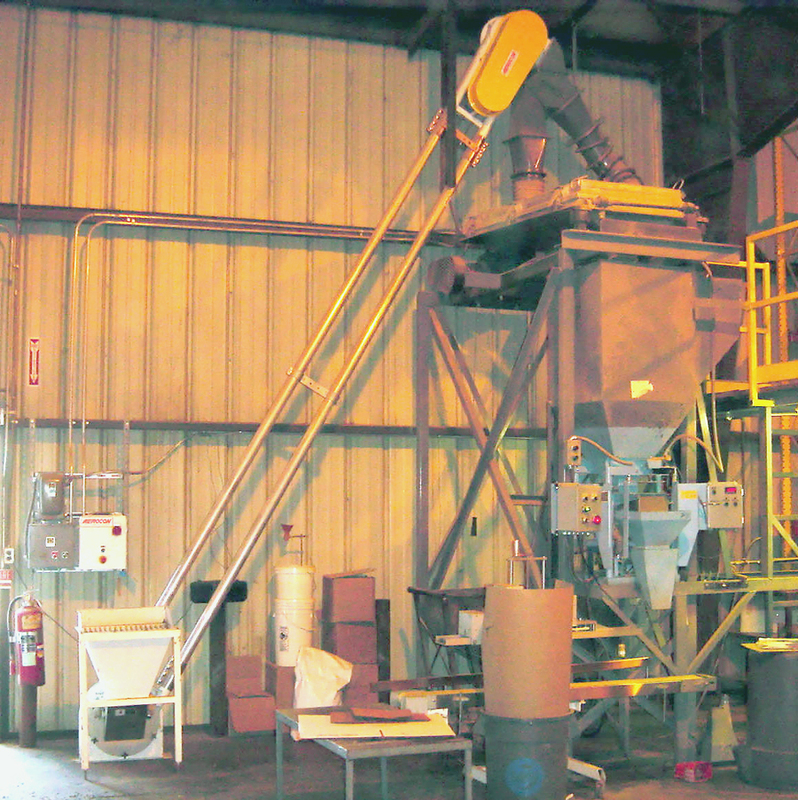 Aerocon Conveyors are available in a variety of sizes, types and materials of construction. These include, carbon steel, 304 or 316 stainless steel. As a standard we provide stainless steel tubing or aluminum with all conveyors, and all carbon steel parts are painted externally with epoxy baked finishes or environmentally safe and durable powder coating. Stainless steel can be bead blasted, brush finished, or mirror polished by hand. We offer a wide variety of disc materials and feature our unique snap-together replaceable discs, or the more traditional three-part assemblies in nylon, polyurethane, polycarbonate, and U.H.M.W. depending on the particular application. 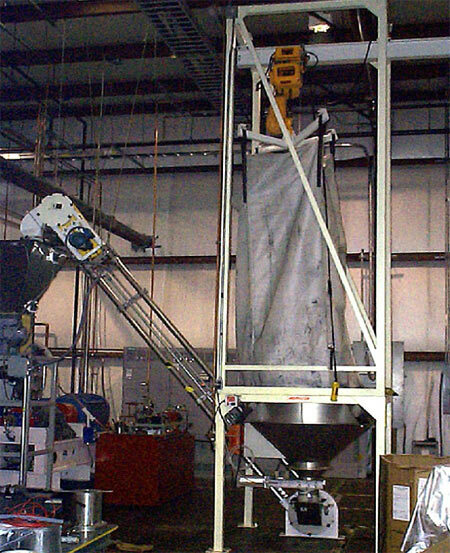 With the ability to convey through multi-planes, around corners, at any angle from 0 to 180º degrees, and at a variety of conveying speeds, the Aerocon system is highly versatile. This versatility is not limited to the ability to match geometry, but includes the versatility of the product conveyed. The system allows for a range of bulk densities from as low as 5 pounds per cubic foot to 200 pounds per cubic foot, a range of particle sizes from 5 microns to 1/2" pieces, and a range of powder properties from free flowing to cohesive, all to be handled by the same machine. True versatility is not just here the machine can be used, but also the range of materials it can handle.